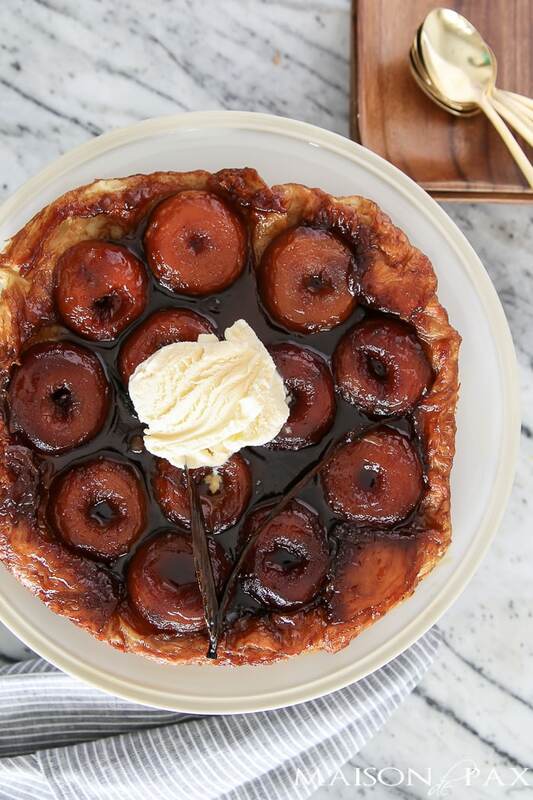 Tarte Tatin is a traditional French dessert incorporating caramelized sugar, apples, and a puff pastry crust. 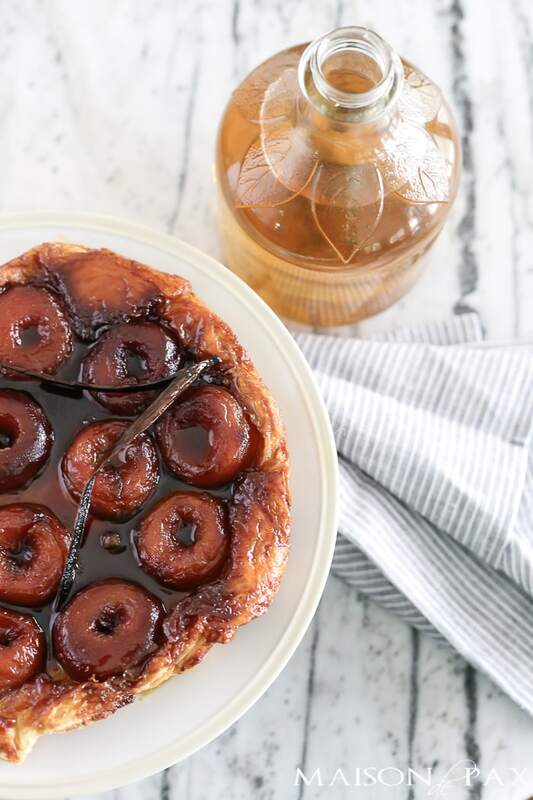 This tarte tatin recipe uses vanilla bean and halved apples for a gorgeous, rustic dessert perfect for fall. A few blocks from our apartment in Paris was this little bakery. 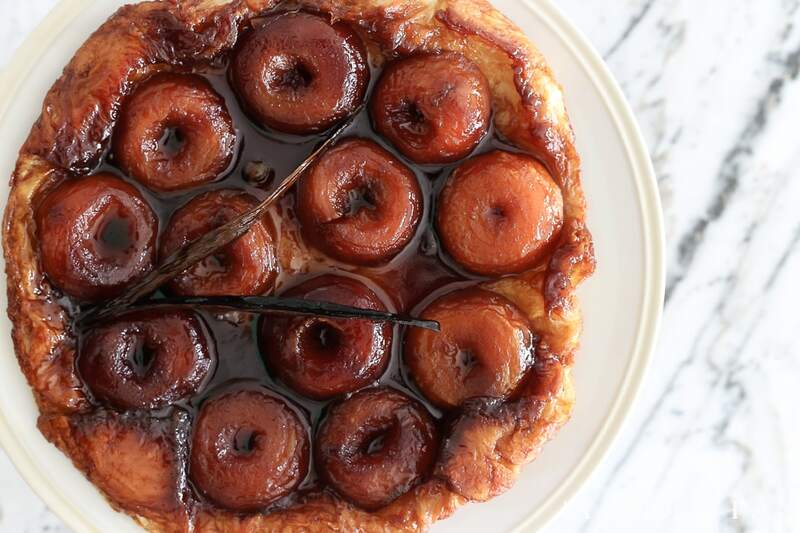 And while I admit that I never ate tarte tatin at that cafe, I could think of nothing else as I made this warm, caramelized dessert. I don’t even know if they serve it there, but everything about this dessert reminds me of that place: buttery flaky crust, perfectly baked fruit, sweet and warm gooey goodness. I confess that cooked apples are not my favorite food. My brother has even dubbed me “un-American,” since I don’t really like apple pie much as a result. 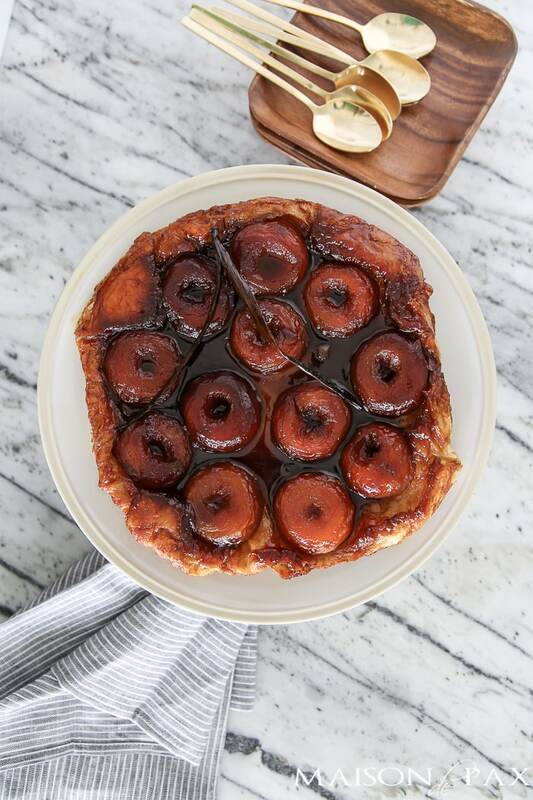 But even I enjoy a good tarte tatin: the sweet little apples bathed in caramelized sugar which oozes around the puff pastry… yummm…. Peel your apples, cut them in half, and use a spoon to dig out the core. As you go, put the apple halves into a bowl of water with 1 T lemon juice to keep them from browning. Heat sugar, apple cider, and 1 T lemon juice in skillet over medium heat. Half the vanilla bean length wise and scrape out the seeds, adding them and the bean casing into the skillet. As sugar begins to caramelize (turning brown and getting thick), add the apples. Note: sugar caramelizes at a VERY high temperature… Be careful when doing this! Also, just as you think your caramel might be about to burn, the apples should add a significant amount of liquid as they begin to cook. It saves the caramel. 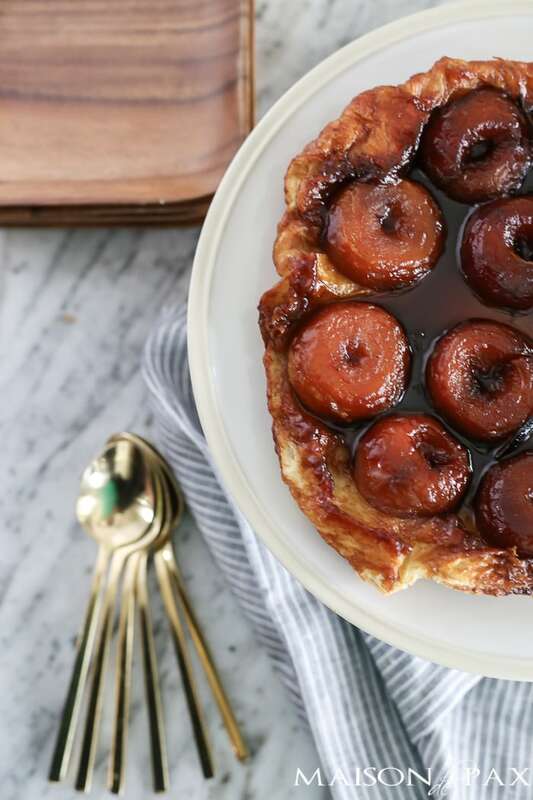 Carefully coat the apples with the caramel and then arrange them flat side up in the skillet. Cook for approximately 5 minutes, until the caramel begins to thicken again as the water from the apples cooks away. Add the butter and remove from heat. 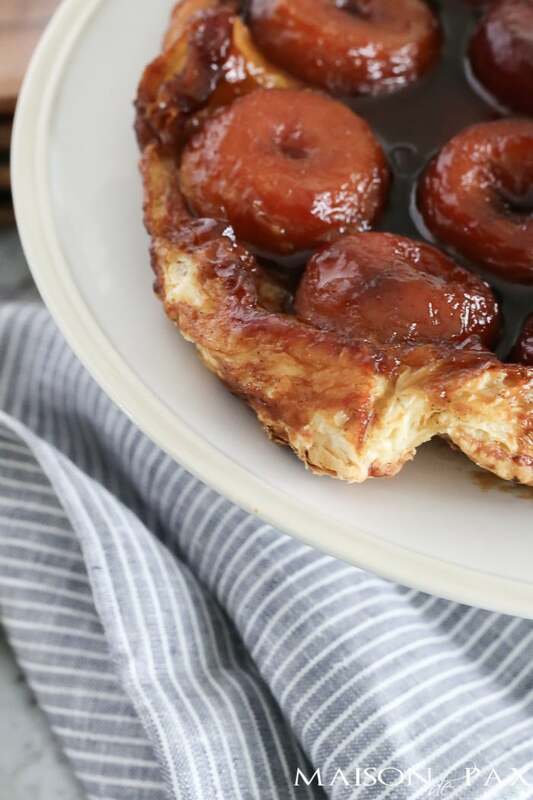 Quickly cover the apple mixture with the puff pastry and tuck the pastry down into the sides of the pan around the apples and caramel (use a smooth so you don’t burn yourself!). Put the skillet into the oven and cook for 25-30 minutes, until the pastry is a nice, golden brown. When you remove the tarte from the oven, allow it to cool for 5-10 minutes. 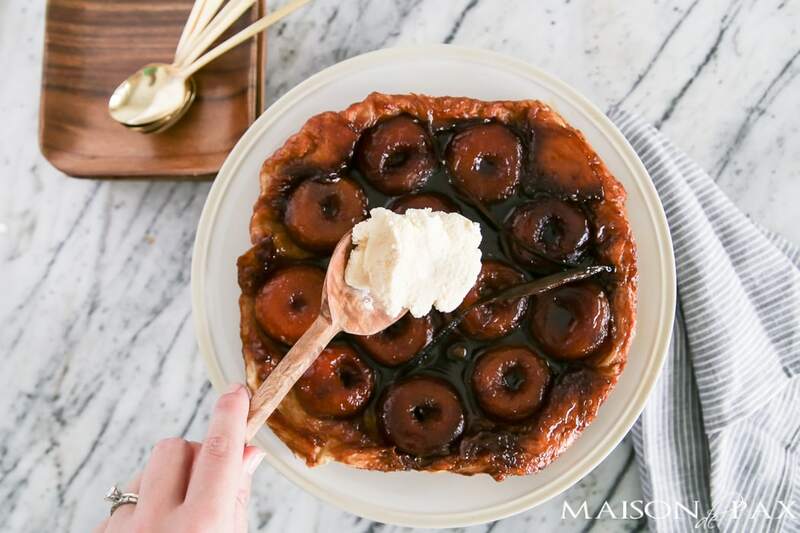 Using a plate, platter, or cake stand that is slightly larger than your skillet, cover the skillet with the plate and carefully flip them so the tarte is apple side up. Serve in slices with a scoop of marscapone or vanilla ice cream. Now for more fall apple recipes, go visit all my friends below! Thank you Chloe! 🙂 I’m ready to head back to Paris! Wow. This looks like heaven in a slice! Pass a piece my way please. Love your presentation too! 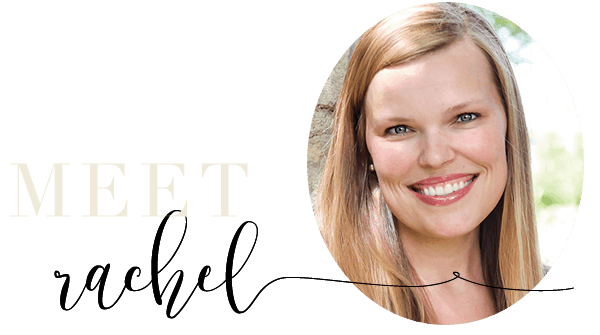 Thank you Michael…It was so fun to make too! This looks like a wonderful treat! And your pictures are perfectly lovely! Thank you, Randi! It was scrumptious! I can practically taste how delicious this dessert is through your beautiful pictures!